When Family Ride tweeted about Seattle’s only bike lane marker without a helmet (Amsterdamize!) I became briefly obsessed with street markings in San Francisco. I had a memory of a helmetless bike lane marker down in the Mission somewhere, but I haven’t found it yet. 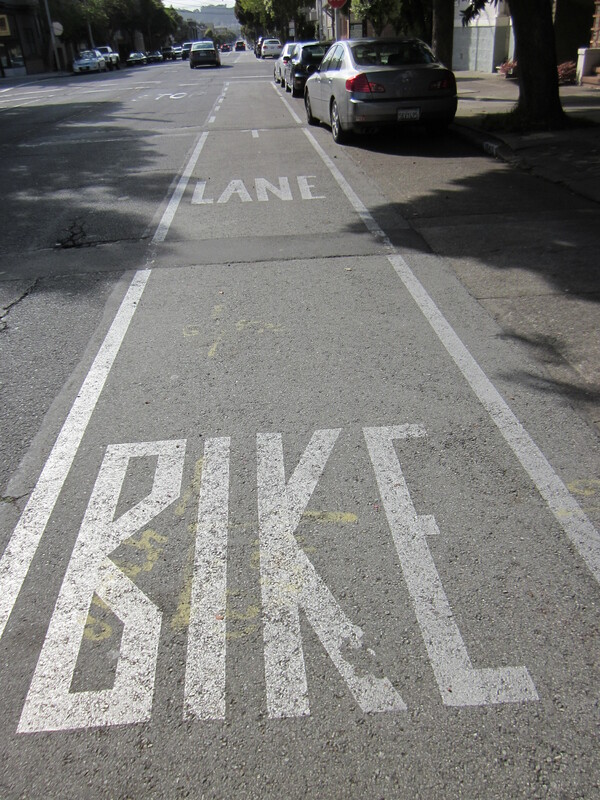 In the meantime I realized that there was a minor war apparent in San Francisco’s bike lane and sharrow markings. Ground zero is Golden Gate Park. From the north side of the park, riding on streets and up the hill behind the Conservatory of Flowers, street markings are dominated by the typical rider with a helmet on a bike. But on entering the park and for several blocks south, the bicycles have cast off their riders. These roads are owned by the forces of Bicycle Liberation. In Golden Gate Park, bicycles roam free. It is particularly disconcerting to reach the top of the hill and see a free bicycle marker head-to-head with a ridden bicycle marker. I now imagine being knocked off my bicycle by freedom fighting cycles every time I get to the top of the hill. They’ll get me when I’m tired. No helmet could protect me. There is a demilitarized zone on the north edge of the park where the markers avoid the controversy altogether by simply writing the words, “BIKE LANE.” I realize that it’s unfashionable these days to use words instead of symbols on street markings, but this does sidestep the question of whether bicycles should be ridden. Perhaps one day this area will be the Camp David used to broker out a compromise between humans and bicycles. San Francisco tries to be respectful of all oppressed minorities. I cannot count the times that I have been asked by non-residents what the Q in LGBTQ, now the abbreviation of choice in the city, stands for. Mostly people get the Lesbian Gay Bisexual and Transgender parts (although not always). When I report that the Q stands for queer and questioning, I know that the conversation will take a hiatus while my questioners gasp for air through their laughter. “Questioning?! ?” they wheeze. Well, all cities have their little quirks, and in my opinion San Francisco could do worse than recognizing that some people are on the fence. At least this is easier than trying to explain what a Romeo flat is. At any rate, it seems that free bicycles have made inroads into City Hall, because new bicycle lane markings are now evenly split between free bicycles and ridden bicycles. I have no idea how it will all pan out, but plan to ride my captive bicycle for as long as this is allowed. Love this post! Now, I can’t tell from your photos if this is the case in SF, but in Seattle the bike rider is only in bike lanes and the bicycle with chevrons is a “sharrow” indicating cars should share the lane with bikes. You’ll have to do more documenting and get to the bottom of it. I like that old school BIKE LANE. We have some a few older versions of sharrows around town consisting of a bike rider inside an arrow that looks like a house. 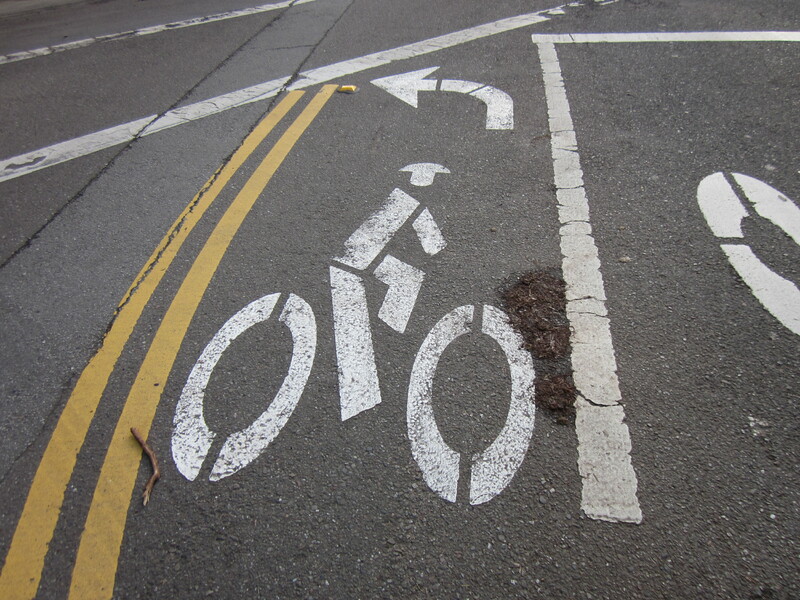 And our bike lanes icons vary in helmet size and which direction they face depending on when they were painted. Oh, and there’s the whole movement of augmenting bike lane riders with breasts, wings, horns, parrot on the shoulder, etc. I think you’re right about bike lanes v. sharrows–I checked on my commute home and the roundabout route I took this morning. There are a lot of BIKE LANE markers, actually, but the rider seems to be bike lane-specific. I can’t believe I missed that! The sharrows (share arrows) are used in many cites, all meaning it’s a shared lane; please expect and respect bikes. Sharrows have an interesting story that started in the Wiggle. We (1990s activists at the SF Bike Coalition) asked the street engineers to paint a symbol in wider street lanes where bikes often go) that would tell car drivers to expect bikes. We offered a design that looked like a bike in a house-shaped arrow, done with lime-green paint. Engineers aren’t rebels, so they declined, saying it wasn’t a standard, accepted California street marking. Knowing full well that nobody is gonna sue SF based on it, we begged them (unsuccessfully) to reconsider. Then we went right to the top: Emperor Willie Brown gave the go-ahead and the street crews started painting them, first in the Wiggle, then in other established spots on bike routes with wide lanes. There are still a few of these lime-green houses visible on Polk Street and on Grove at the Civic Auditorium. The design was changed to white with a bigger bike and chevrons instead of the distracting house-shape because it was easier to see what it meant. 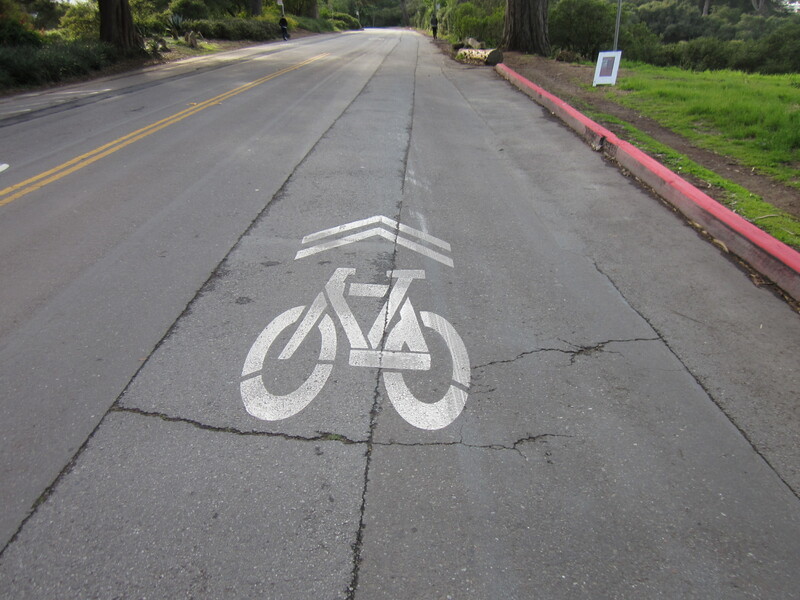 Eventually, the sharrow became standard and spread to California, then other states and countries. I include this and other bike activism historical discussion (along with geography and urban history) in my Walk the Wiggle tour.